Online marketing for websites includes search engine optimization, email marketing, blog development and link building. These tactics also apply when marketing for industrial websites. The specific nature of industrial marketing means that online tactics must be more targeted towards an industrial audience. Press releases for new industrial developments and blogs that highlight trade shows are some examples of industrial-specific online marketing techniques. The website design and navigation of an industrial website must also be considered when dealing with the industrial marketplace. Request for quote forms are highly necessary for industrial websites as well as pages highlighting industries served. 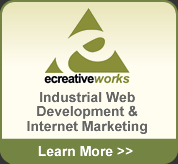 Ecreativeworks Industrial Internet Marketing. Minnesota interactive marketing company focusing on the industrial marketplace. SEO, blog development and email marketing are among our services for industrial marketing.